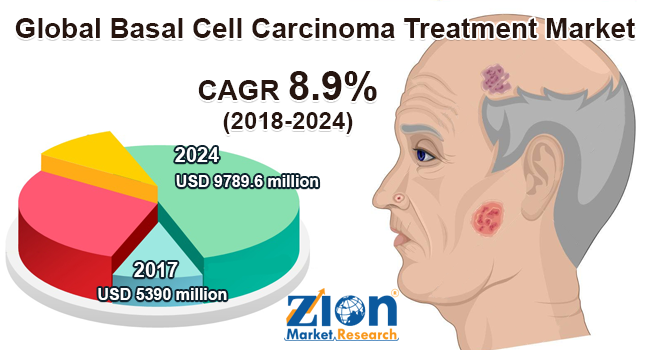 Zion Market Research has published a new report titled “Basal Cell Carcinoma Treatment Market by Treatment Type (Surgery, Drugs, and Others) and by End-user (Hospitals, Specialty Clinics, and Other End Users): Global Industry Perspective, Comprehensive Analysis, and Forecast, 2017 – 2024”. According to the report, global basal cell carcinoma market was valued approximately USD 5390 million in 2017 and is expected to generate revenue of around USD 9789.6 million by end of 2024, growing at a CAGR of around 8.9% between 2018 and 2024. Basal cell carcinoma (BCC) is uncontrolled and abnormal growth is seen in the basal cells of the lower epidermis. It does not spread to other body parts but in the rare condition it may metastasize and can be proved as life-threatening; however, it may go deep in skin and bones. It is caused due to the overexposure to ultraviolet rays and the lesions formed during the BCC looks like open sores, red patches, or sometimes look like bumps. There are various treatment options available for the treatment of basal cell carcinoma which includes surgery, drugs, and others. Immunosuppressants are further expected to increase the probability of basal cell carcinoma as the immune system is compromised by the effect of these drugs. Basal cell carcinoma market is mainly driven by the increased prevalence of various skin diseases such as melanoma and others. Furthermore, increased prevalence of cutaneous malignancies is expected to promote the growth of basal cell carcinoma treatment market. As per the American Cancer Society 2018 report, it is estimated that around 91,270 new melanoma cases will be diagnosed (about 55,150 in men and 36,120 in women). Melanoma cases are more than 20 times more common in whites as compared to African Americans. The overall lifetime risk of getting melanoma is around 0.1% (1 in 1,000) for blacks, 2.6% (1 in 38) for whites, and 0.58% (1 in 172) for Hispanics. Moreover, increase in the geriatric population, coupled with the increased prevalence of skin disorders and favorable reimbursement policies are expected to drive the growth of basal cell carcinoma treatment market. Basal cell carcinoma market is segmented on the basis of treatment types which include surgery, drugs, and others. Surgery segment is expected to grow rapidly in the global market over the forecast period. Based on end-user, the basal cell carcinoma treatment market is segmented into hospitals, specialty clinics, and others. Hospitals segment is expected to be the fastest growing segment over the forecast period. The key regions of global basal cell carcinoma treatment market include North America, Europe, Asia Pacific, Latin America, and the Middle East and Africa. North America is expected to grow significantly over the forecast period due to the presence of developed countries such as the U.S., Canada, and others. Europe is expected to be closely followed by North America in the near future. The Asia Pacific is expected to grow moderately over the forecast period. Latin America and the Middle East and Africa are expected to experience a considerable growth within the forecast period. Some of the key players in basal cell carcinoma treatment market include Merck & Co. Inc., Valeant Pharmaceuticals International Inc., F. Hoffmann-La Roche Ltd., Mylan N.V., Sun Pharmaceuticals Ltd., Allergan, Inc., Allergan, Inc., Perrigo Company plc, and Strides Arcolab Ltd., amongst others.